Sydney: Australia were 236/6 as rain forces early stumps on the third day of the fourth and final Test match between Australia and India here on Saturday. It was a really disappointing day for Australia with only Harris, Handscomb and Cummins able to hold their heads high. So far, the match is in the favour of India as the hosts were 236/6 in 83.3 overs, trailing India by 386 runs, when the umpires took the players off the field due to deteriorating lighting condition.Peter Handscomb and Pat Cummins are still at the crease and they have four wickets in hand and two more days to save the Test match. Earlier, Australia were 198/5 at tea. Spinners put India on top as Kuldeep Yadav claimed three wickets and Ravindra Jadeja took two scalps.Though Australia got off to a good start, but lost their momentum and India took complete control by the end of the first two sessions. In the post-lunch session, Ravindra Jadeja took two wickets in Marcus Harris (79) and Shaum Marsh (8). Kuldeep Yadav, who dismissed the opener Usman Khawaja in morning, struck again just before the tea-break to get Travis Head (20). Meanwhile, pacer Mohammed Shami also dismissed Australia's new number three batsman Marnus Labuschagne (38). At lunch, Australia were 122/1 at lunch, trailing India by 500 runs. The four-match Test series is currently led 2-1 by India, who are eyeing their first ever Test series triumph in Australia. The four-match Test series is currently led 2-1 by India, who are eyeing their first ever Test series triumph in Australia. 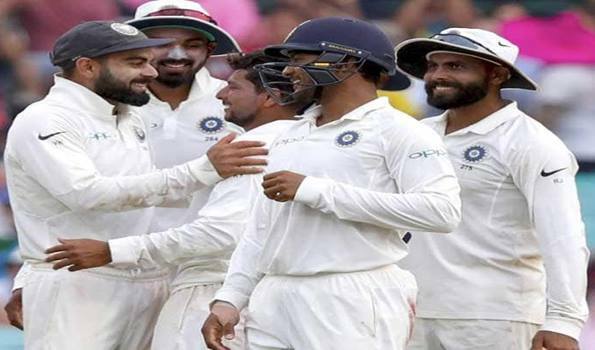 On Friday, India declared their first innings on 622/7, which was second highest total in Australia, the hosts played cautiously and ended up with no loss on the second day. Australia trailed India by 598 Runs.